The countdown to Saengerfest begins - 100 days to go! 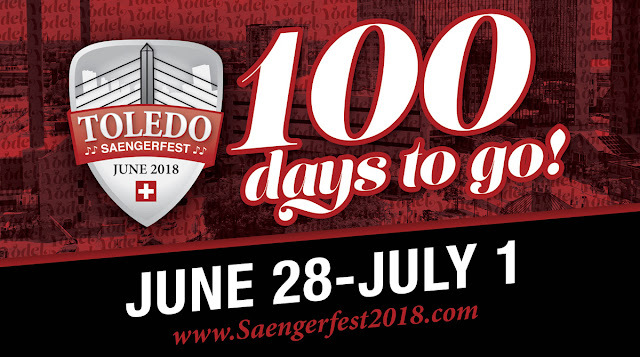 In just 100 days, The Toledo Swiss Singers, one of the area’s oldest singing groups, will host Saengerfest 2018, an international Swiss singing and yodeling festival, in the heart of Downtown Toledo. The Singers will welcome more an a dozen other choirs from across North America, as part of the triennial festival. The Singers are part of the North American Swiss Singing Alliance (NASSA), made up of 14 choirs from Canada and the U.S. Hundreds of singers from around North America will descend upon the Glass City for the long summer weekend, beginning Thursday, June 28, and running through Sunday, July 1. The festival will culminate in a must-see Grand Concert on Saturday, June 30, on the historic stage of the Valentine Theatre. The groups will compete at a Prize Song Competition earlier in the day. Both events will be open to the public. Tickets will go on sale later this spring. The most recent competition and festival was held in June 2015 in New Glarus, Wis. The Toledo Swiss Singers brought home gold and silver prizes from the competition. Visiting choirs are staying at the newly renovated Renaissance Toledo Downtown Hotel, reserving a majority of the more than 240 rooms. The choirs will socialize, meet and gather inside the hotel ballrooms, as well as prepare for the competition and Grand Concert singing. With Toledo in the international spotlight, the Singers hope many from near and far will join them for an unforgettable festival and Grand Concert on June 30. Information is also available for sponsorship and advertising opportunities at the festival. Currently under the direction of Micah Graber, the choir has been a cultural staple in the Toledo area since 1869. This year, the Singers will mark 150 years of celebrating Swiss culture in the area. The chorus in its current form has been around since 1924. Its aim is to retain and preserve the culture and songs of Switzerland, to live up to the singers’ ancestors’ tenets of faith and behavior, help others, and to be good citizens. The Swiss Singers practice Wednesday evenings at 7:30 at Oak Shade Grove and are still looking for interested singers and volunteers to participate in Saengerfest 2018.